The Study was exactly that. Prince Concepts had been interested in utilizing the traditional Quonset Hut in a live/work capacity for some tie as these structures are typically used in military and agricultural applications. Even though land in Detroit can be inexpensive, material and labor costs are what they are. The challenge - how does one create a market where there isn't one? The answer - use creativity to usurp traditional construction while achieving an elegant, inspired, alluring, and affordable product. Enter the Quonset Hut. Built on two merged residential lots totaling 5,227 SF of land, The Study is two live/work residences erected, BY RIGHT; in other words, the project required no zoning variances. Expediency and experimentation were paramount, as the project was used to test the Quonset Hut as an affordable and inspired building method for future projects. The Study is located at 4704 16th St in Detroit, 48208; just SW of the Grand River and Warren intersection. Even though the site is just under two miles from the heart of Downtown Detroit, it's a neighborhood that had seen a sharp decline in commercial activity and residents since the the 1960s. Prior to The Study, no ground had been broken in this area, and the majority of the areas surrounding it, for over 50 years. Prince Concepts owns 200,000 SF of land and about 100,000 SF of buildings in this immediate area, and The Study - with the Quonset Hut as its hero - was trying to understand how that trend could be changed. Measuring 21'2"w x 32'4"l (690 SF) and 31'w x 32'4"l (1,000 SF), two concrete slabs were poured and connected to 12" wide x 42" deep concrete footings. The concrete pads would also serve as the finished floors in the residences. "CREATIVITY IS ONLY INTERESTING WHEN PAIRED WITH PERMITS!" Prince Concepts employed Steelmaster as their Quonset Hut Vendor. They purchased one Q and one S model. The S20-13 model has straight walls leading into the ground while the Q30-14 model has a 100% arch with no straight walls. Each hut comes in many pieces which are eventually assembled into 2' wide arches that span from one footing to the other at the finished height of the building. Each unit requires 1000's of screws! 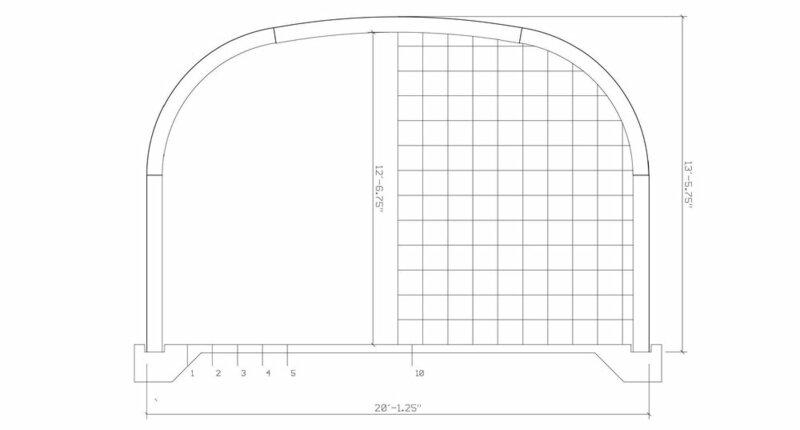 With a quonset hut, you get two walls and a roof for the fraction of the time and cost of those elements, typically. You also get an elegant and novel structure. The walls become the roof which become the walls again, lovely. WELDING THE HOT ROLLED STEEL. Fusing galvanized 2" angle steel to a raw steel tube. Other than the Quonset Hut shell, everything else employed in The Study was devised, designed, and assembled by the Prince Concepts team, on site. To create the "end-walls" of the huts, Prince Concepts used energy efficient and insulated 32MM Thermogal from PolyGal. These panels were then placed within the raw steel angles and tubes that Prince concepts welded into a frame. The result is tough, effective, and not too precious. The polycarbonate panels are translucent, but not transparent. The natural light in the space is abundant, the insulation is immense, and the aesthetic is inspired. To a passerby, the huts glow at night, and rouse intrigue and curiosity during the day. They are warm, tough, and beautiful. The largest challenge faced by Prince Concepts in converting a Quonset Hut into a comfortable live/work space was addressing the insulation and acoustic needs. The metal spaces needed to be softened. Period. Steel lacks insulating properties and the "hill and valley" shape of the walls meant traditional applications were not effective. After deliberating several options, the team opted to use 6" of spray foam to fill in the metal framework. This equates to an R-38 insulation value. and Project Manager, Joe, discuss insulation options. Spray foam insulation in use. After jumping the insulation hurdle - a functional problem - a formal problem had now arisen - how to cover this insulation in a cost effective and beautiful manner... Prince Concepts decided to utilize two different methods, one on each hut. After all, this was The Study. The Q Hut uses standard 2" x 4" wood studs to create a frame. From there thin pieces of 1" x 2" wooden shims were affixed to the 2" x 4" studs, so the cladding could be flush. The Q hut employed plywood sheets for their warmth, low cost, and ability to bend to the shape of the hut without splintering or compromising the elegant arch form. Success. However, this wasn't enough, on Hut #2 the level was UPPED. The S Hut used the same 2" x 4" wood stud skeleton, but received an additional interior treatment - concrete stucco was slathered across the walls and ceiling creating a modern, monk appropriate sanctuary. Q HUT: Finish plywood panels. Both Study Huts have sleeping lofts which were after thoughts. Upon building the spaces, it seemed like sleeping close to the "arch" of each hut would be calming, and heck, what human doesn't want more space. Prince Concepts researched a variety of materials during The Study, one of which was acoustic sound foam. The sound dampening qualities coupled with the geometrical shape made for a visually pleasing and functional addition to the under portion of the Q Hut. Interior styling within the Quonset Huts is unique to its form. Their defining feature, the curve, inspires serenity and focus. Vital volume is also gained and retained from the curve. With ceiling heights nearing 14ft, a maximization of the square volume is easier to achieve. Hut life is inspired! The Study proved to be a success, both huts were constructed at their budget, were immediately leased, and are currently occupied in live/work capacities. Visitors from all walks of life, colors, creeds, and socioeconomic classes respond exactly the same way to the live/work bunkers "Damn, I want one of these. This is crazy. I love it!" The Quonset Hut is democratic. The Study's success provoked the design and groundbreaking of True North, which is nine Quonset Hut live/work residence directly across the street. The game will be seriously UPPED over there.